Eleanor OKell’s talk is now available to listen to. It attracted a large number of audience members who had not attended a previous talk and was rated very highly, see if you agree! 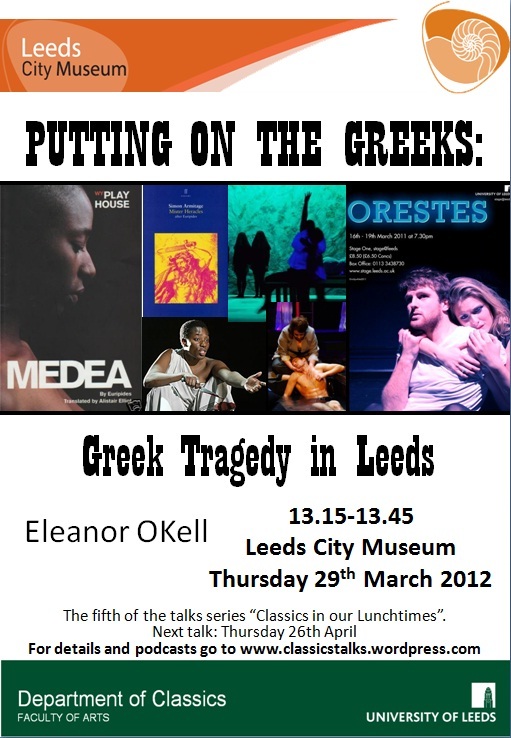 Dr Eleanor OKell, expert in the reception and staging of ancient drama, focuses on the questions of why Greek tragedy is staged nowadays and what factors contribute to Leeds being the location of choice for premieres of new Greek tragedies. The presentation covered the role of George Rodosthenous (PVAC, University of Leeds), the West Yorkshire Playhouse, Northern Broadsides and the Yorkshire playwrights Ted Hughes, Blake Morrison and Simon Armitage. Find the talk with the rest of the series on the Museum Talks page.